The contemporary alcove tub from the Aqua Eden collection is a great choice when looking for a bath tub. Constructed from solid acrylic made to be both durable and reliable. Deep soaking tub has a 64 Gal. tub capacity. Nothing highlights and compliments the overall look and feel of a bathroom like the Nice II Seamless Freestanding bathtub from Acri-tec. Preferred by professional designers, a freestanding bathtub allows you to artistically position your tub for the best, most relaxing view, or to simply create more space. With ergonomically shaped, ultra-deep bathing wells, every Acri-tec freestanding tub is designed to provide the ultimate in luxury. Each Nice II Seamless Freestanding bathtub is hand-crafted using high-gloss, non-porous, stain resistant, white acrylic and offers completely hidden plumbing. To make installation easier, we've pre-installed four adjustable levelling legs to allow for irregularities in your floor without dealing with the complications of shimming. When you're ready to make a bold statement with a sophisticated design, choose an Acri-tec freestanding bath to create a beautiful, one-of-kind space. Americast<sup></sup> is American Standard's proprietary, revolutionary alternative to cast iron that's more durable, 50% lighter and costs less to install. Thanks to inherent manufacturing advantages, Americast<sup></sup> bathtubs can be made deeper, flatter, roomier and just as sturdy as their cast iron counterparts. For your comfort, the Princeton series has added integral lumbar support and a beveled headrest to the tub interior. The tub features full slip resistance and is available in a wide array of finishes. Also an optional integral drain with Lift and Turn drain assembly is offered on Princeton tubs. Enhance your bathroom with American Standard - Made in the USA. This ProFlex<sup></sup> bath has a space-saving design that does not sacrifice comfort. The smooth finish of the high-gloss acrylic is easy to clean and resists chipping and cracking, and the tile flange simplifies installation and prevents the possibility of water damage behind the wall. For three-wall alcove installations, this unit includes a left-hand drain outlet and is designed for deck- or wall-mount faucets. Also available in store by special order only see store for details. Contemporary 5 ft. Acrylic Left Hand Drain Rectangular Alcove Non-Whirlpool Bathtub in White The contemporary alcove tub from the Aqua Eden collection is a great choice when looking for a bath tub. Constructed from solid acrylic made to be both durable and reliable. Deep soaking tub has a 64 Gal. tub capacity. 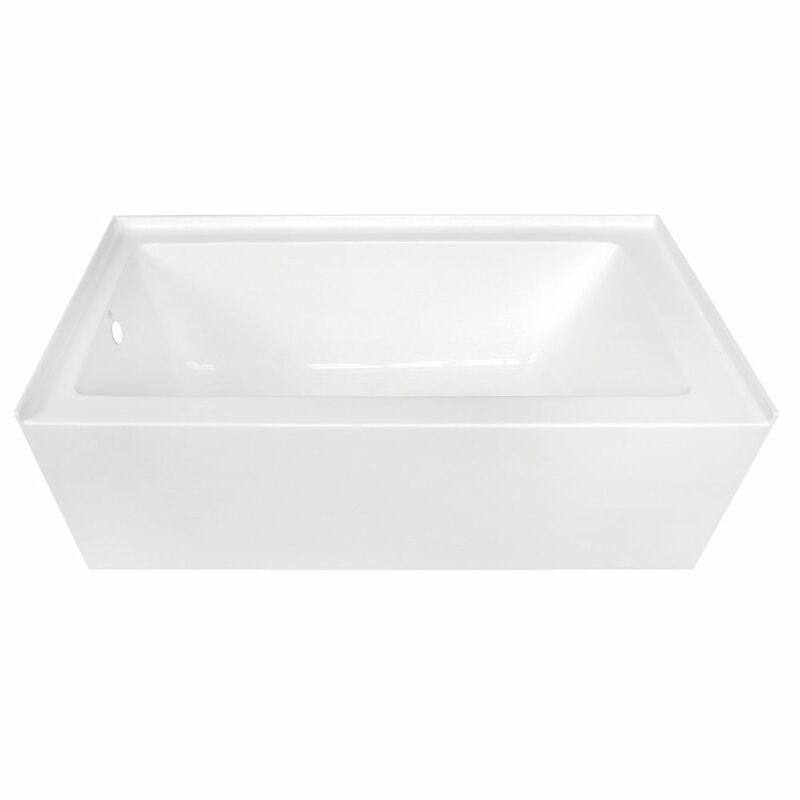 Contemporary 5 ft. Acrylic Left Hand Drain Rectangular Alcove Non-Whirlpool Bathtub in White is rated 4.4 out of 5 by 28. Rated 5 out of 5 by HomeDepotCustomer from Beautiful modern tub!... Beautiful modern tub! Rated 4 out of 5 by Stephanie from It looks great. It seemed a little cheap & hollow... It looks great. It seemed a little cheap & hollow to me but maybe that’s normal. Either way it was the contemporary look we were going for! Rated 5 out of 5 by Brad from Beautiful looking tub!... Beautiful looking tub! Rated 4 out of 5 by dadSpelledBackwards from Great bathtub. Replaced a 50-year old cast iron tub with this. Was worried that the acrylic stuff... Great bathtub. Replaced a 50-year old cast iron tub with this. Was worried that the acrylic stuff would be too flimsy. Not this bathtub. It’s acrylic, I think, but it’s super sturdy and not as noisy as other bathtubs when the water runs. I like the clean lines and squarish look. It is, however, a soaking tub - meaning that it is DEEP. Which is great but getting out requires a little agility. Rated 3 out of 5 by Lisa from Had this installed by a contractor who told me he... Had this installed by a contractor who told me he would need to reinforce the bottom and spray foam to support the sides. I was able to push the material in on the flange side. Seemed flimsy. Improved with additional reinforcement. Now the tub looks and works great. Rated 1 out of 5 by Kaity from If i could give this tub a zero star rating i would. Ours came defective. The rim all along the... If i could give this tub a zero star rating i would. Ours came defective. The rim all along the tub bows toward the wall, not into the tub. This causes a 1/4" permanent lake of water to pool at the back of the tub almost instantly. Unfortunately installer did not catch this, it only became apparent the first time we went to actually use the tub. Now, after paying someone to install it, paying someone to mess with it to see if they could fix it, i NOW have to pay for someone to TEAR IT OUT and install a new tub. I'm never buying anything from this company again. What an extremely expensive nightmare. Haven't called the manufacturer yet but i'm not expecting much help based on the other reviews.